Making a connection is the most important part of any marketing plan, and there’s no better way to connect with consumers than with the internet. A website serves as a headquarters for your business, inspiring many brick-and-mortar stores to move entirely to the internet. Not only do you have the opportunity to reach a broader audience, but the chance of winning a customer’s favor over the competition is all decided by the look, feel, and features of your website. Most consumers will avoid a business if they do not have a website, as not having a website is much like a storefront with no name, signs, or any indication that it’s more than an empty building. Perhaps you’ve already created a website, but reality is knocking on your door with a big surprise: it may not be enough. An acceptable website five years ago is considered an old duffer yelling at kids to get off their lawn today, and the most pressing concern is one thing: consumers will notice this. 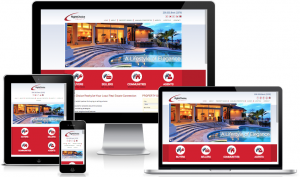 It might be time to create a new website for your business, and here are four reasons why: 1. It’s Not Designed to Suit Mobile Users Statistics show that 46% of customers browse the internet on their phone only, and if your website makes it difficult for them to navigate or even access from their phone, they won’t give you the benefit of the doubt. The mobile craze has exploded over the recent few years, and while your website may not have needed this function before, it certainly does now. A mobile-friendly site requires pages to be downsized to fit smaller screens, features to be modified or excluded to match slower processing times, and pictures to be resized to keep their proper look in a reduced size. By creating a new website, by using available templates or by hiring a professional designer, you can avoid blurred pictures, buggy features, slow loading times, and bulbous pages, instead enjoying a website that looks crisp, modern, and designed with functionality in mind, encouraging visitors to choose you over the competition. 2. It Doesn’t Match Modern Styles People spend a great deal of time online and have an eye for what quality looks like. First impressions are everything, especially with businesses. The visual appeal of your site can be the deciding factor between a web surfer who continues to browse your page and one who clicks away, so if it was built a few years ago and matches the styles, trends, and themes of that time, a consumer will notice this difference and see your website as old, outdated, and inactive. This gives the impression that your business is of lower quality than the competition, which has devoted the extra effort to staying current, engaging, and modern. It may be time to create a new website – one that shows the originality, credibility, and creativity of your brand. With the right designer, the look alone can compel a consumer to keep browsing and learn about additional services you have to offer, boosting your success. 3. It’s Not Search Engine Optimized (SEO) SEO is one of the deciding factors in a website’s success, and inherently the business’s as well. By including very carefully chosen keywords in your website content, you can enhance the likelihood of your website arriving on the first results of a Google search. Most people never click beyond the first page of their search results, making it vital for your business to be amongst the highest ranks. As SEO is relatively new and always evolving, if your website lacks the necessary keywords, you’ll have a better chance of showing up on the last page than the first, forever being lost to the boneyard of the internet. Meanwhile, the competition thrives with their SEO websites and their high rankings, taking away your potential profit. By creating a new website, you can revise your content to include these vital keywords to match the latest trends. Additionally, you can even create new content altogether, offering a fresher and more engaging impression to consumers while boosting your rankings. 4. It Doesn’t Have Fresh Content A website serves as the headquarters for your business in the digital world, where curious consumers, random web surfers, and potential business partners can browse what you have to offer, what your work ethic is, and whether you’re the right choice. Having this hub is vital, but as times are evolving, a successful website cannot be a stagnant one. Fresh content and activity on a website shows consumers that you are present, engaged, and looking to interact with them, offering a real personality that they can trust over a silent page for them to browse. It’s wise to include a blog function where daily or weekly posts are made on information relevant to your business or field. This can broaden your chances of ranking higher in a search result, and will gain a wider range of visitors who may visit for your blog post but stay for your services. In the worst case, should a consumer not make a purchase, they are still becoming familiar with your brand, making them more likely to recommend you to others. Free eBooks serve this same purpose, as consumers may not be interested in purchasing your service but will be interested in reading a small eBook. This gives them an opportunity to learn about the personality and credibility of your business. As a bonus, you can gather their email addresses for newsletters, enhancing your marketing potential. A successful business in the modern age must have a website, but an outdated one without the correct features has a chance of harming you instead of helping. The latest, most enhanced, most trending, and most active site is the one which will garter attention, rival against competition, and keep you in high favor. With this in mind, it may be time to create a new website for your business, revitalizing your internet presence while presenting consumers with a new, fresher look. The opportunities are endless! Book a tour today to see if CoWorking is the right choice for you.